Eau Pleine (1) -- includes Runkel's Mills P.O. The following transcription was taken verbatim from the above-referenced 1878 atlas (starting at page 233). I have broken the lengthy paragraphs into shorter paragraphs to make it easier to read, but otherwise have tried to be true to the spelling, text and punctuation of the original document. Although I've done my best to be accurate, there may be transcription errors that I failed to catch. This county is one of the most central in the state, and is bounded on the north by Marathon, on the east by Waupaca, on the south by Waushara and Adams, on the west by Wood. Since the formation of Portage county, in December, 1836, it has been subjected to more frequent and radical changes of territorial limit than perhaps any other county in the state. The Portage of the Wisconsin river, from which the name is derived, was near the center of the county, as at first organized. Portage City was the county seat, though mentioned in the act organizing the county, as Winnebago City. The county was attached to Brown for judicial purposes. 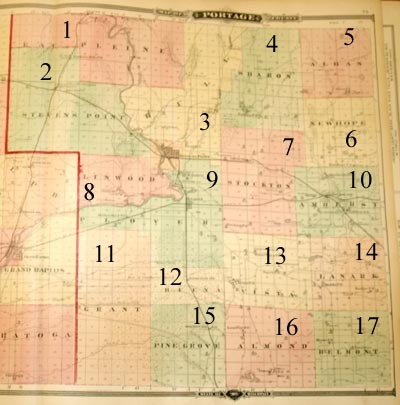 During the legislative session of 1837-8 the first change of boundary was made, whereby the four townships on the east, numbered ten, eleven, twelve and thirteen, of range thirteen, were transferred to Dodge county. In January, of the same session, the entire county was formed into one town named Iowa, and the election polls were established at the Indian agency house. On the 12th day of January, 1838, an act was passed which, among other provisions, established the county seat at Kentucky City - a place wholly prospective, and which has since remained only a paper city. Portage county, at the time, and down to 1841, was almost identical in boundary with the present county of Columbia. Sauk county having been formed in January, 1840, taking a township and a fraction from "Old Portage," left the latter with territory equivalent to about eighteen townships, until February 18, 1841, when a large addition was made upon the north, comprising all the area in ranges from numbers two to nine inclusive, commencing with township fourteen, north, and extending to the northern boundary of the territory of Wisconsin, with the slight exception of fractional townships fourteen and fifteen, in range nine. Thus was Portage county made to reach two hundred miles farther north and to embrace two hundred and forty-one additional townships. The whole was then attached to Dane county, for judicial purposes. An election for the purpose of organizing for county government, was authorized to be held on the fourth Monday of March, 1841; returns of this election were to be made to the clerk of Dane county, and the county officers elected were to hold their office at "Wisconsin Portage." The voting places of the several election precincts were established at Franklin house, in Portage; Stevens Mills, at big Bull Falls; house of E. Bloomer, at Grand Rapids; house of Abraham Brawley, on Mill Creek; and at Dickson & Stroud's mills on Crawfish river. The people having neglected to hold this election, the legislature passed a special "Relief Act," February 9, 1842, authorizing the sheriff of Dane county to call an election of county officers, in Portage county, on the fourth Monday in March, 1842, to hold office until the first Monday in January, 1843. By an act of the legislature, approved May 31, 1844, Portage county was authorized to organize with all county privileges, and was assigned as a portion of the second judicial district. On the 18th day of April of the same year, the people voted to accept the provisions of this act, and also voted on the location of a county seat. The north end of the county triumphed, and Plover became the county seat, instead of the other contestant, Fort Winnebago, at the Wisconsin portage. The first election of county officers occurred on the fourth Monday of September, 1844. There were then elected for county commissioners, Mathias Mitchel, Benjamin F. Berry, and Luther Houghten; sheriff, Nelson Strong; treasurer, John Batten; while George Wyatt was honored as circuit clerk, county clerk and register of deeds. Court was first held at Plover, on the first Monday of April, 1845, in a house or store belonging to Keith & Miles. David Irwin, Jr., was the presiding judge, and the first case was that of Abram Brawley vs. Andrew Dunn and Henry Carpenter. Columbia county was formed from Portage county, by an act of February 3, 1846, and its northern, eastern and southern boundaries were the same as those of the Portage county of 1838. 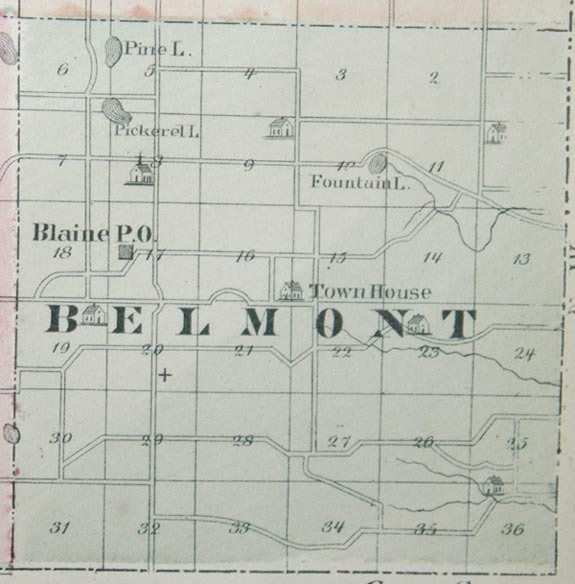 The western line of the new county was run partly by surveylines, partly by Fox and Wisconsin rivers, and partly by "lands owned by the Menomonee Indians." 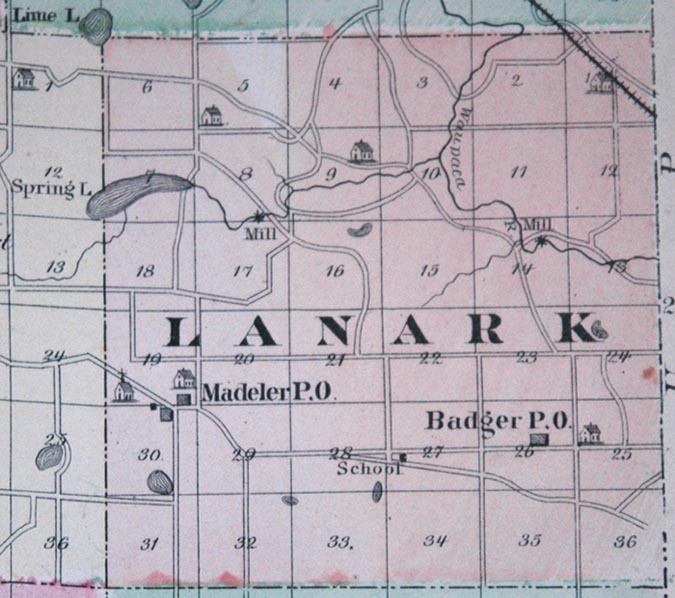 On the 11th of March, 1848, all the territory in Portage county lying southwest of the Lemonweir and Wisconsin rivers, was organized as Adams county. 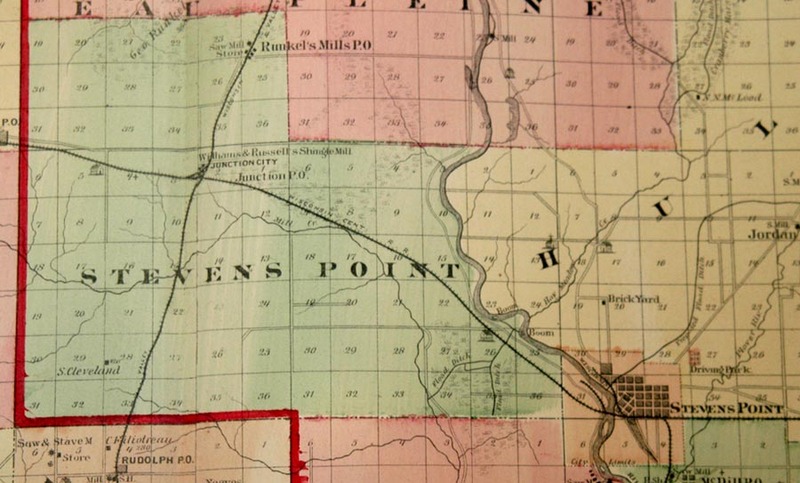 On the 4th of March, 1849, Portage county against lost territory amounting to twelve townships on the southeast which were attached to Marquette county. By an act of March 8, 1849, all of Portage county then remaining south of line between townships twenty and twenty-one, north in ranges two to nine inclusive, was apportioned to Adams, Columbia and Sauk counties, respectively; and thus was established for the first time, the southern boundary of the present Portage county. 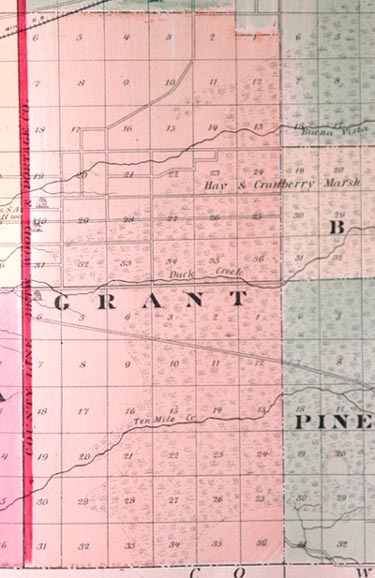 This line is sixty-six miles north of the southern boundary of Portage county, as it was formed in 1836; in fact, it is forty-two miles north of the northern line of the original county. 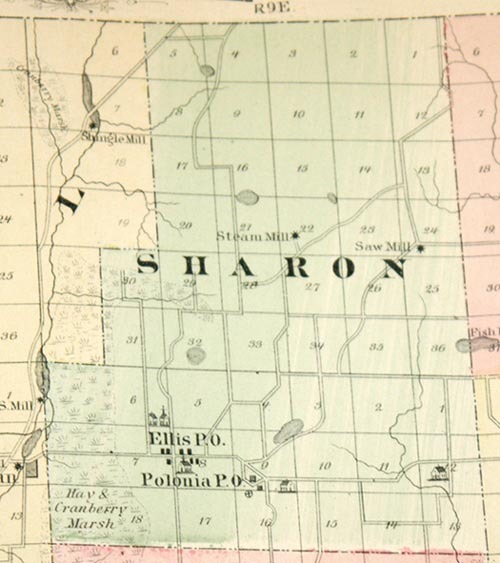 On the 9th of Februry [SIC], 1850, Portage county gave three-fourths of its entire area to form the county of Marathon, which embraced all in ranges two to nine inclusive, commencing with township thirty-six and extending to the northern limit of the state. 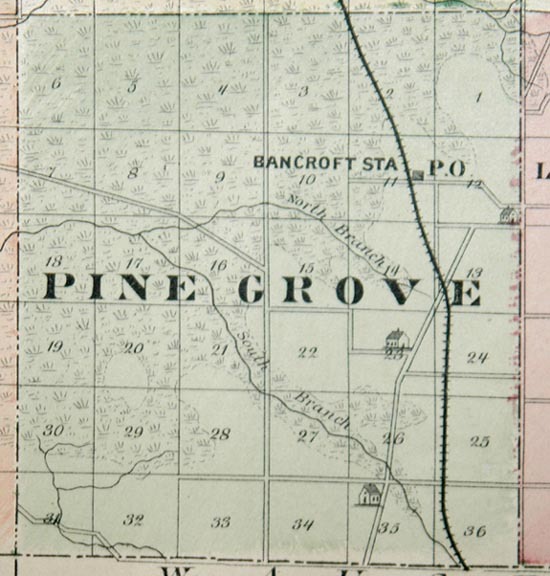 The line separating townships twenty-five and twenty-six, which was then established as the northern boundary of Portage county, has remained unchanged to the present date. 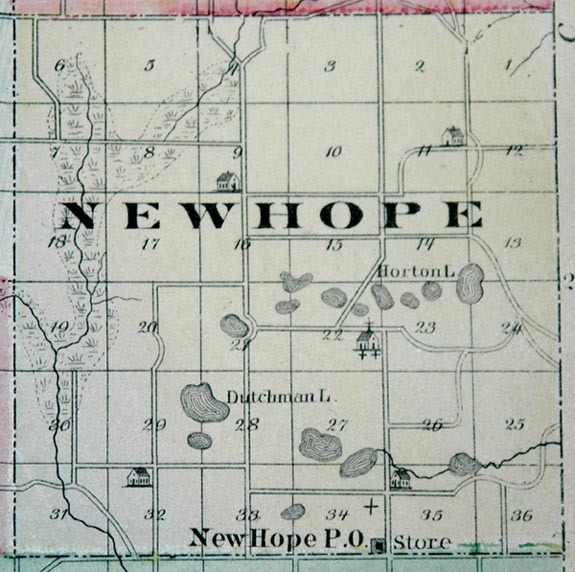 On the 27th of February, 1851, an addition of the five townships on the east in range ten, was made to Portage county, which then received its present eastern boundary, and included forty-five townships. This was divided March, 29, 1856, taking one-half, or twenty-two and a fraction townships on the west, to form the county of Wood. 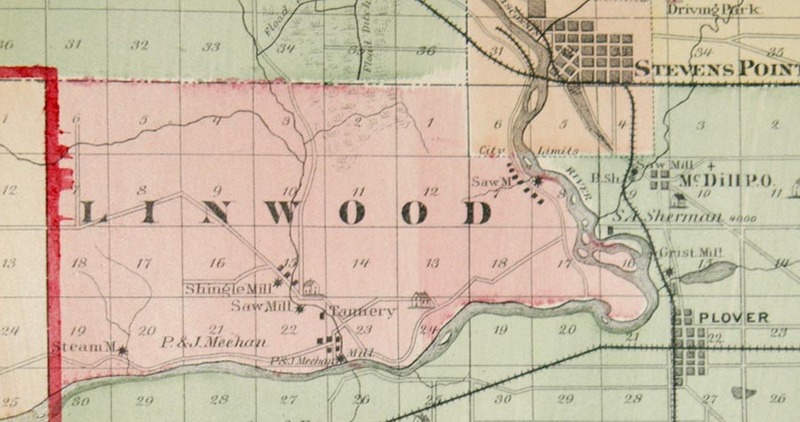 The Wisconsin river divided the two counties in township twenty-three, of range six, but during a special session of the legislature, the whole of that township was assigned to Wood county; and thus, on the 19th of September, 1856, Portage county received its present western boundary, and its territorial limits have since remained unchanged, having undergone thirteen changes in twenty years. The earliest history of this region describes it as belonging to the Sac (Saukis, or Sauk) tribe of Indians. However, the Menomonees gradually settled down from around Green bay, so that when trading posts were established here, in the early part of the nineteenth century, it belonged to the latter tribe, and was ceded by them to the United States government. The first land disposed of by them was in 1836, and included a strip three miles wide, on either side of the Wisconsin, extending from Point Bass, in what is now Wood county, forty miles up the river to Big Bull falls. This was especially made to cover the operations of the lumbermen. Previous to this time, Dubay's trading post was the only house in the entire region. This tract was surveyed in 1839 by Deputy United States Surveyor Joshua Hathaway, of Milwaukee, and was offered at the public sale in the following year, at Mineral Point. Up to this time settlers were but few. The entire population of what is now Portage county, at that time was about one hundred. Prominent among these were Mrs. Brawley, the only white woman in the county, Abraham Brawley, Horace Judd, John G. Hebard, Richard Veeder, Gilbert Conant, Peter Barnard, Daniel Campbell, and James Harper. The opening of the six mile strip was heralded far and near, and people began to pour in from various quarters. The eligible mill sites were rapidly taken and the building of mills began. The first saw-mill erected was upon Mill creek, built by Abraham Brawley in 1839. Perry & Veeder occupied a site on the same stream soon after. Campbell & Conant, also, in the same year, erected a mill on the Conant rapids of the Wisconsin. Bloomer and Harper built one the following year at McGreer's rapids on the Big Plover. The lumbering interests made rapid advances during 1840-1. Mills went up at all the advantageous points on the Wisconsin and its tributaries. For several years the lumber manufactured found ready sale at Galena and Dubuque, to which points it was rafted by the Wisconsin and Mississippi rivers. The first raft run over Shaurette rapids was conducted by Hiram Stowe, in 1842. About this time, men began to cast about for means of obtaining supplies at a cost less than was incurred by wagoning them from southern Wisconsin, or northern Illinois. This brought about a trial of the soil. Some of the lumbermen began breaking the openings and planting some roots and grain. Such experiments proved successful, and eventually many of those who had come to the pineries with their teams, to engage in the logging business, changed their minds and settled down quietly to farming, and found a ready market for their produce among the lumbermen. The first entry of government land was made by Garland Harris, on the twelfth of January, 1841. It was located in the vicinity of Conant's rapids. The first farms opened in the county were those of Hiram Hartwell and George W. Franklin, who opened a little east of Plover. In 1842, Houghton & Batton built the first tavern in this section. It was situated at the present site of Plover. They also obtained license, at the first meeting of the county board of commissioners after the organization of the county in 1842, by which they were allowed to retain "fire water" and kindred drinks. In the following year, Mathias Mitchel built the first house in the vicinity of Stevens Point. Abraham Brawley also erected a building at the same place; both were used as taverns. In the latter, Mrs. Brawley was landlady. A son born to Abraham Brawley was the first white male child in the county. In the same year a daughter was born to Uriah Merwin. The Methodist missionary, J.S. Hurlbert, began work among the settlements this year, and took charge of a large circuit. 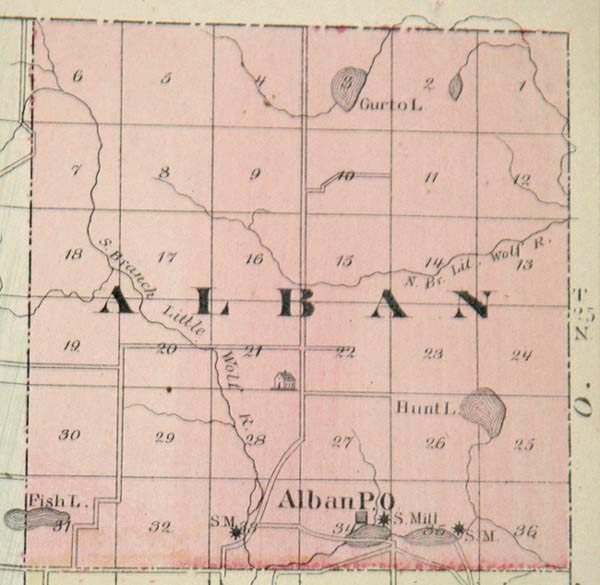 The first lawyer in the county was James S. Alban, who arrived in 1843, and located at Plover, which was at that time the county seat. In the year 1844, Charles Maddy and Henry Mularky built a warehouse at the present site of Stevens Point. Immediately after, Richard Gardner followed, and erected a dwelling house. Other buildings were soon added, so that the village gave positive evidence of being the future city of Portage county. In 1846, the first stock of goods was brought into the county by Robert Bloomer. In the same year, the first day school was kept by Miss Amanda Hale, now Mrs. N. F. Bliss. It was held at Stevens Point, in a board shanty, which stood on the ground now occupied by the Mansion house. In 1848, Dr. Bristol arrived, and had an extensive ride from Point Bass to Bull Falls. By this time the various interests of the county had made considerable advancement. The population was numbered by thousands. Mills were erected at all the available points. The country around was fast filling up with farmers, and Portage county was fairly on the road to the prosperity which she has since attained. There were no building at this "point" prior to the fall of 1843, when Matthias Mitchel erected a frame house at what is now the foot of Main street; it is now standing as an "ell part" to Curran hotel. Abram Brawley, who came to Mill Creek in 1838, began a home here also in 1843. George Stevens, of Belvedere, Illinois, in 1844, stopped his ox-wagon here, and transferred his goods to "dug-outs," on his way to Big Bull Flats. This place, at the foot of a long slack-water in the Wisconsin, was a favorable point for trans-shipment from wagons to boats, and soon became known as "Stevens Point." A warehouse was an immediate necessity and the Charles Maddy and Henry Mularky supplied this growing want by erecting the third building at the "point" in 1844. The two first buildings served as taverns. In one of them Mrs. Brawley was landlady. She came in 1840, and was the first white woman in the limits of the present Portage county. She still lives at Stevens Point, bright, hale, and sixty-five, keeping house for her sons. Her husband died in the rebel prison at Salisbury, North Carolina, having been taken prisoner six days before the expiration of his three years' service. The first allusion to Stevens Point in the records of the county board was in granting a license to H. W. Kingsbury, he having built a tavern on the south side of Main street, in the winter of 1845. 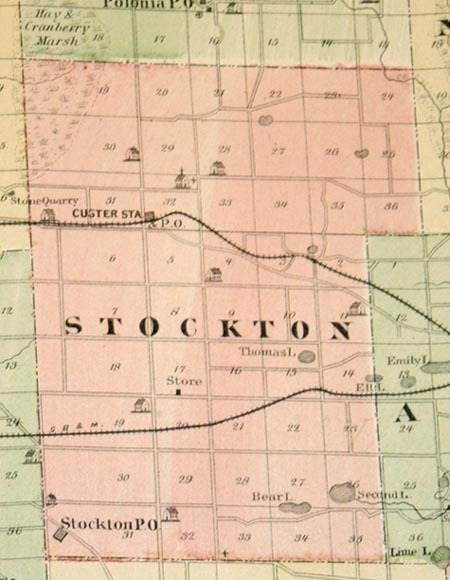 Several families and score of buildings constituted Stevens Point in 1846. John Eckels, present sheriff, was a sturdy pioneer of 1840, and for thirty-two seasons he acted as river pilot. He has frequently served his town and county in an office capacity. Among the first lawyers was Elisha Morrow, who represented this district in the legislature of 1846-7. Contemporary with him was the accomplished Wm. L. DeWitt, son of Surveyor General DeWitt, of New York. E. G. Bean was the first to act as magistrate, and his first official act was to perform the first marriage ceremony in Portage county. Mr. J. R. Mitchel and Miss Fannie Luther, both of Plover, were by Esquire Bean united in holy matrimony on Christmas day, 1842. The supplies needed for each family or "camp" were hauled with ox-teams from Galena or Green Bay. The first stocks of goods for sale in Stevens Point were offered by Robert Bloomer and the Campbell Brothers, in 1846. 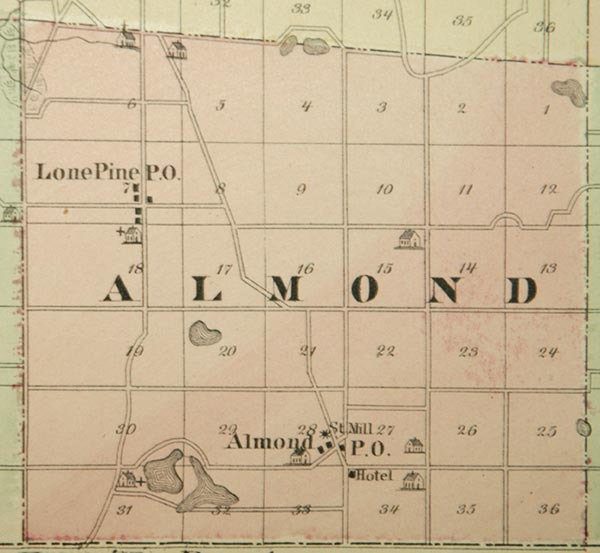 In 1848, the Menomonees ceded all their land, from the Wisconsin to Fox river, of Green bay. It was soon surveyed; immigration became rapid; trade quickened, and speculators flourished. Before 1850, the county had been divided into three townships, also three school districts, each of extensive area. The county commissioners in 1850 were B. W. Finch, S. R. Merrill, and Wm. V. Flemming. According to the United States census, the state of Wisconsin, for the ten years preceding 1850, shows an increase in population of eight hundred and ninety per cent. 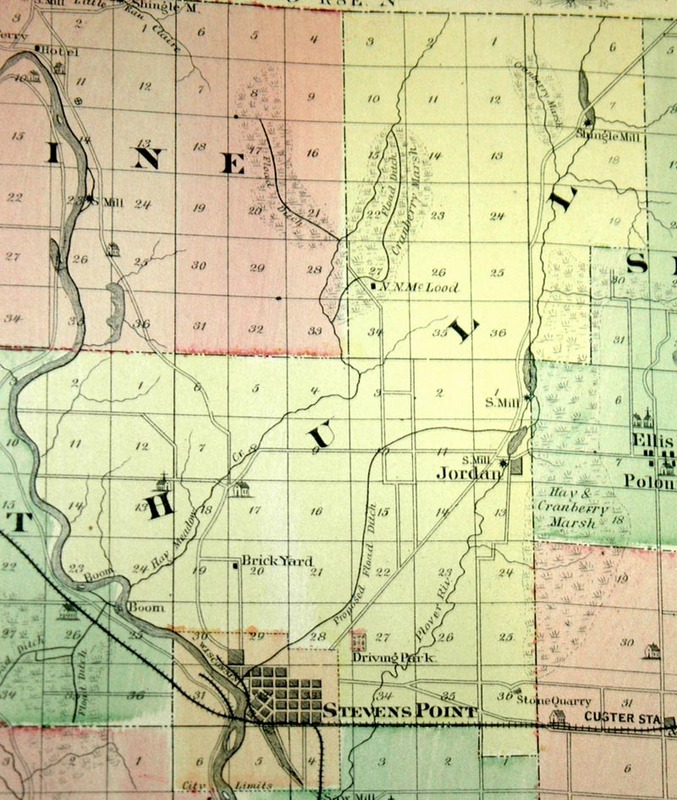 Stevens Point in that time had passed from an uninhabited forest to a thriving village, and then fully organized, with Abram Brawley and Orrin Maybee as supervisors, James S. Young as town clerk, and Ira Vaughn as assessor and collection, and N. F. Bliss as justice of the peace. Wm. Griffin was the first post-master and was obliged to go to Plover for the mails, that being the terminus of the post route. Even then the town was a central point of business for the pinery, and contained "three hotels, four stores, two saloons, several blacksmith shops, and carpenters, millwrights, wagoners, with many traders, especially dealers in lumber and shingles." A. G. Ellis came to the "Point" in 1851 from Green Bay. In 1853 he was appointed United States deputy surveyor. He has surveyed one hundred and fifty-six townships in this state. The same year he was appointed receiver for the United States land office, just then opened at Stevens Point. He has been mayor five terms. With the opening of the land office, prosperity dawned upon the "pinery," and the "Point" throbbed with new impulses. Ox-teams were too slow, and the people gladly received the promises of the delusive Milwaukee & Horicon railroad project, and nearly half a million dollars' worth of securities were handled over to the agents. When the money crisis came, the Horicon scheme vanished; yet the people bled, receiving only dead stock in exchange for bonds and mortgages and deeds of conveyance. In 1858, a fire swept away half the business part of the town, yet the same year Stevens Point was organized as a city, with Wm. Schofield as mayor, and C. B. Curtis as city clerk, and by C. B. Jackson as police justice. The lumber business continued to increase, and by 1868 the pinery products represented at Stevens Point were fully seventy-five million feet. This year, by an act of the legislature, approved by popular vote, this city became the county seat of Portage county. The same year a court house, commodious and elegant, was begun, and when completed, furnished and heated three years afterward, cost nearly forty thousand dollars. It is built of sandstone furnished from a quarry within the city limits, and is an honor to the county. In January, 1853, A. G. Ellis founded the first newspaper in the county at Stevens Point. It was a democratic organ "devoted to the interests of Northern Wisconsin," and named the Wisconsin Pinery. N. V. Chandler was publisher. In 1858 the paper passed into the possession of Caleb Swayze, the present editor and proprietor, and is still democratic. Early in 1864, the Wisconsin Lumberman was started by N. L. Stout, and continued by his son, F. Stout. Afterward it was conducted by E. B. Northrup as The Point, but suspended in 1868. The Stevens Point Journal was founded in 1869 by E. B. Northrup, and managed by him until 1873, when Edward McClachlin purchased the entire concern. The Journal is an eight-column folio. The present proprietors are McClachlin & Simons. There are four good public schools, with a free high school, in the city, supplied with competent teachers and average buildings. The Catholics, in 1873, founded a parochical [SIC] school under general charge of the resident priest, Father Nicholas July. The four teachers are supplied from the Sisters at Notre Dame, and annually instruct about two hundred and fifty pupils. Eight churches, with their efficient pastors, seek to promote the spiritual welfare of the community. All the professions are well represented. John Phillips, M.D., with his gifted wife, settled at the Point in 1848. Mrs. Phillips, is a poetess of considerable note, remembered by her recent volume entitled "Under the Pines," which is said to be the first publication of original poems in northern Wisconsin. The city is situated mainly on the east bank of the Wisconsin, upon a sandy plain elevated about ten feet above the river, and is in 44 degrees 40' north latitude. Soft water is easily obtained from wells ten to twenty-five feet in depth. Two bridges span the river. The water-power is practically unlimited, and affords a boom capacity for one hundred million feet of logs. In the city limits are two flour-mills, six saw-mills and seven shingle-mills. The buildings are mainly wood, though good sandstone can be cheaply procured in the county. The city has an efficient fire department. The Driving Park association has well-fitted grounds. J. D. McLean is mayor, and Almanson Eaton attorney for the city, which, they claim, now contains four thousand inhabitants. It is the largest city upon the upper Wisconsin, and is the chief distributing point of supplies for the pineries. All its industries are related to the lumbering interest. The present county officers are: John Stumpf, county judge; James B. Carpenter, clerk; William Albertie, treasurer; John Eckels, sheriff; J. E. Rogers, circuit clerk; Ole O. Wogsland, register of deeds; Stiles H. Vaughn, county surveyor; J. O. Morrison, superintendent of schools; Oliver H. Lamoreaux, district attorney; G. W. Hungerford, coroner. For several years the people felt that the wagon and the raft were too slow and inadequate means of communication with the outer world, yet they were suspicious of railroad projects. In 1869, Judge Reed, of Menasha, Winnebago county, represented an enterprise which finally succeeded, and on the twentieth of November, 1872, the first train of cars entered Stevens Point from Menasha, over what is now the eastern division of the Wisconsin Central railroad. Capital came; business revived; and, in three years, the population was nearly quadrupled. In 1873, the Green Bay & Minnesota railroad was built from Winona on the Mississippi, intersecting the Wisconsin Central at Amherst, and passing through Plover. In 1876, the southern branch of Wisconsin Central was completed, running from Portage City to Stevens Point, a distance of seventy-one miles. The middle and northern divisions of this railroad, connect Stevens Point with Ashland on Lake Superior; and by the Milwaukee division, the eastern and southern markets are reached. The Wisconsin Valley railroad from Tomah to Wausau, crosses the northwestern part of the county and intersects the Wisconsin Central, not far south of the northern boundary of the county. Portage county voted one hundred thousand dollars to each of the eastern and southern divisions of the Wisconsin Central. That constitutes the entire bonded indebtedness of the county. The roads were built under many adverse circumstances, but are now highly beneficial to this whole region. Stevens Point is the headquarters of the manufacturing department of the Central railroad. Its round-house, turn-tables and machine shops employing nearly one hundred mechanics, are located with a miles of the court-house. This town was first settled in the county. 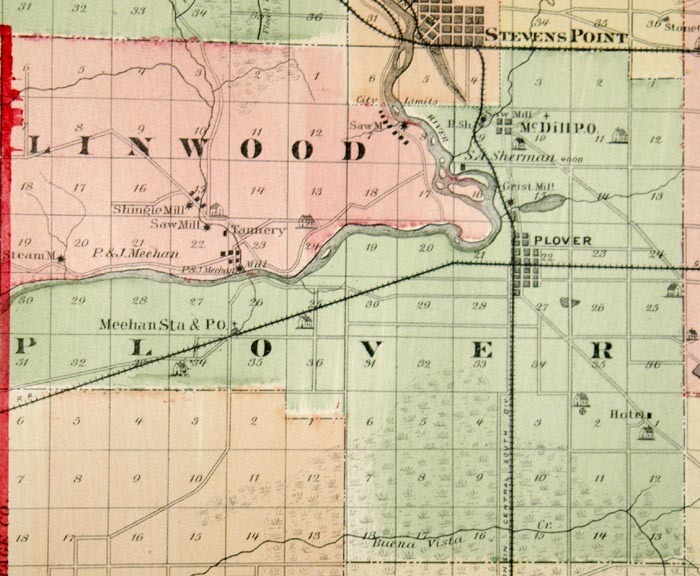 Many government entries were made, and several actual settlers located in 1841 on land including the present village of Plover. The necessities of commerce soon demanded the first tavern in the county, which was built at Plover in 1842, by Houghten & Batten. The first lawyer, James S. Alban, came in 1843, and was a prominent citizen until his death. He, with Jervis W. Carter, started the Plover Herald in August, 1856. H. G. Ingersol was the printer; he is present editor and proprietor. The paper has always been actively republican, and is known as the Plover Times. The first warranty deed was given by Andrew Dunn to Andrew Mularky, and is dated October 2, 1845. James Wyatt, as deputy register of deeds, recorded the same on the 2d of December, 1845. The village was platted in 1846, having been for two years the seat of justice for an area which is now represented in eleven counties. Simon A. Sherman was an active pioneer of 1848, and has ever since been identified with the lumber interest. For a quarter of a century he has been proprietor of the mills at Conant Rapids, near Plover. The first grist-mill built north and west of Fox river was erected in 1851, by John R. Mitchel, at Springville, a little above Plover. The farming lands east and south of the village are well cultivated. Plover has a population of fully five hundred, and is quite a commercial center. It is the junction of the Stevens Point & Portage and the Green Bay & Minnesota railroads. It has a good schoolhouse, two churches, five mills, several stores, shops and hotels, and settled mainly by Americans. 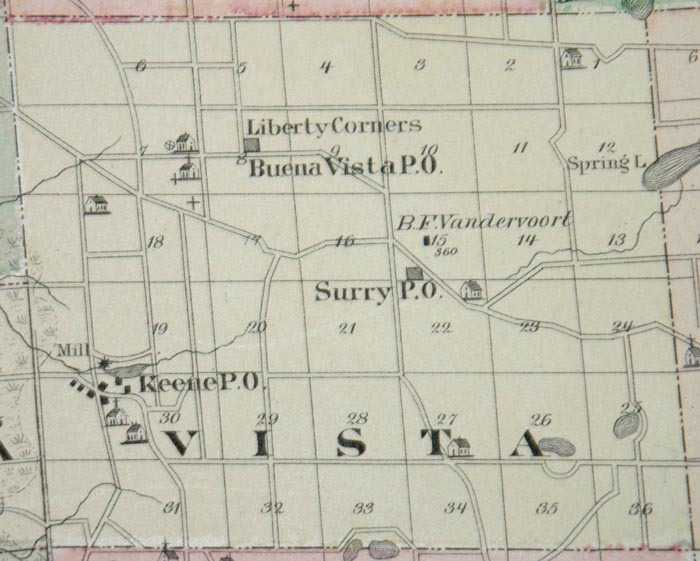 Beside Stevens Point and Plover, there are the manufacturing or railroad villages of Buena Vista, Jordan, Almond, Eau Pleine, McDillville, Springville, and Amherst. The last mentioned is the largest. It is situated on the Wisconsin Central, and a junction is formed in the township with Green Bay & Minnesota railroad. In the population, the Norwegian element predominates. A good farming county surrounds Amherst. The population of the village is now only about three hundred. 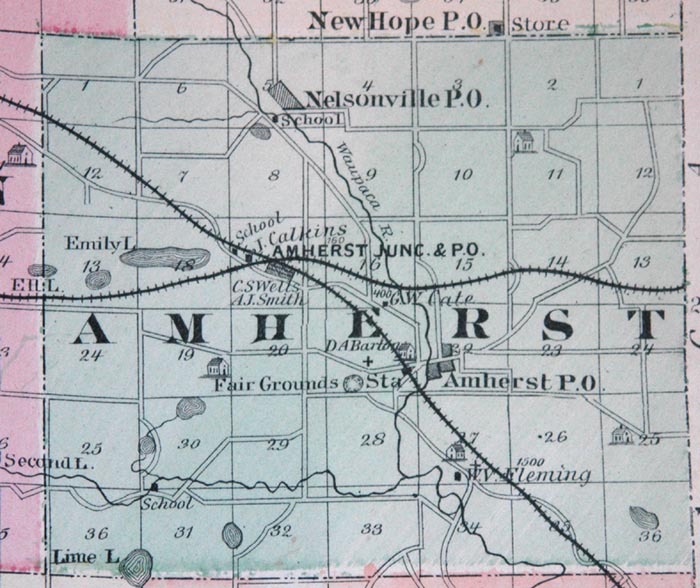 The fair grounds of the county agricultural society are located at Amherst. The officers of the society are William V. Flemming, president; H. S. Rood, vice-president; William Loing, treasurer; and A. J. Smith, secretary. The exhibitions are highly credible and well attended. In the village of Polonia, town of Sharon, the "Polish Felician Order" have erected a substantial stone convent, which accommodates two hundred students, and an elegant church is now being erected; the entire cost of these buildings is fully thirty thousand dollars; the township is settled mainly by Polanders. The surface of the county slopes gently to the south, with no mountains of deep valleys; Musquito Bluff, in the western part, is the highest point. Geologically, the county is on the lowest strata of Paleozoic formation, or the Potsdam sandstone; yet the general level is two hundred feet above Lake Michigan. By the census of 1875, the population numbered 14,857. There are eighty public schools in the county, with an attendance, in 1875, of 3,221. With more than half a million of acres in the county, there were, in 1876, only thirty-two thousand cultivated, exclusive of the grass lands. Originally, the county was an extensive timber-tract, mainly of pine, especially along the rivers, with a few oak openings in the southeast. Hay and cranberry marshes are not uncommon, and tamarack swamps are seen occasionally. The north is still covered with pine forests, and the northeast is quite bluffy. A strip about a mile wide, upon east side of Wisconsin river, is very sandy. On the east, it gradually changes to a fertile yet sandy loan; on the west, it soon becomes richer, with a clay sub-soil. Sandstone quarries of good building material, are found in different parts of the county. Granitic formation of azoic or metamorphic rocks, about in and along the largest rivers. The people in the county are about one-half Americans. The northeast part of the county is almost wholly Norwegian; the southwest is largely composed of Germans. The floating population comprise a large percentage of the workmen in the winter camps of the pineries. Many Indians continue to make Portage county their home. A few have settled upon farms, but most still lead a nomadic life, relying for subsistence upon fish, game, and berries of all kinds, which are found in abundance. Farming is remunerative, and must some time become the leading industry in the county. Sufficient wheat and other grain was raised last year in the county to supply the eight flour and feed mills. The farms, at present, are in the eastern and southern sections of the county. These farming communities, together with the "Point," constitute nearly all the permanent population. Hop raising is becoming an important interest in the eastern half of the county. In 1876, there were fully a quarter of a million pounds of hops shipped. This county was first settled by seekers after pine lands, and the lumber interest still overshadows all others. There are twenty-four saw-mills in the county, with a capacity for manufacturing 109,250,000 feet of lumber per year. The last season being uncommonly dull, only about 63,000,000 were manufactured. The twenty-one shingle mills of this county have a capacity of 140,000,000, but in 1876 only 51,400,000 were made. The value of all the pine products during the past year, is fully one million dollars, at present low prices. The hardwood supplies are comparatively untouched. The season of 1877, has been remarkable for the early melting of snow, thereby preventing the transfer of logs from the pinery to the river or mills, and hence greatly diminishing the lumber products.